Are You Ready for the Coming of the King? Just a reminder to any who may notice this in the Jenkins, Missouri area. 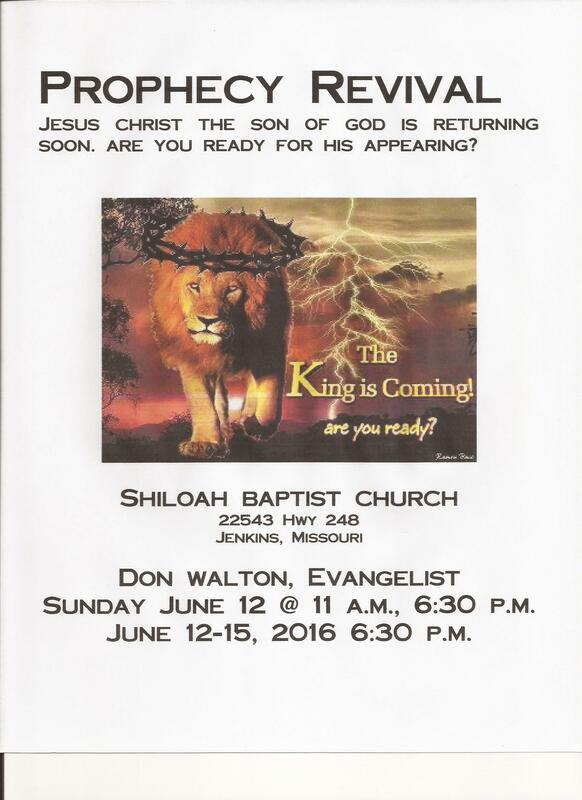 We are having a Prophecy Revival at Shiloah Baptist Church June 12 – 15, 2016. Evangelist Don Walton will be preaching, there will be special music. All are welcome. We want one and all to be ready when Jesus comes for His Church; and that is all who believe in His Son, and trust His finished work – the death, burial and resurrection. Looking forward to seeing you at these special meetings. You will hear great Biblical exposition of the Bible prophecies of Christ Jesus, His return, and the only message of salvation.